Now as Shaktimaan has saved his friends from the venom of Kakodar (aka J J), he have all the reasons to cheer up right? Sure, but he is not in mood for the same! Why? Well, he got to know that the cake was poisoned to kill him! He was the target and the kids of Shaktimaan’s fan club have suffered due to him! He then decide to get to root of the cause and face J J personally. We are still watching the content of the first DVD (of economic DVD set of Shaktimaan). Kakodar and his team was not happy with the results of their plans and they were discussing better fatal plans to get Shaktimaan out of their way when Shaktimaan arrive to meet them. As he knew that J J and his team is interested in knowing all about his powers, he willfully does so. These scenes have a lot of good dialogs and comparatively discouraging special effects. Especially, these days we are used to watch good quality movies in HD and SFX, VFX and other technologies gave us a chance to view the technically great visual effects, we are disappointed to see the same in this TV Serial. Also the quality of video in economic DVD pack is quite disappointing. The background music is nice though. The good thing about the good people also prove to be bad thing for them sometimes! For example while showing off his powers and asking J J and his team to not to drag innocent people to test his powers, Shaktimaan exposed his weakness! He care for people! He cannot see people suffering or dieing. Dark and shady but smart J J noticed it and played it again Shaktimaan! How? Well, you need to watch the episode for that. Now Shaktimaan is all of a sudden disappeared!!! Crime started raising its ugly head once again and Gangadhar cannot do anything to save people! Even people at Geeta’s office started questioning dependability on Shaktimaan. They even raise logical questions that such dark incidents started happening after the arrival of Shaktimaan! The conversation between Shaktimaan and his Guru is very thoughtful and it explores a lot of human attributes. It also explores that the real power lies in one’s self. When you yourself are in any dilemma, you cannot use your abilities at their best. And it is not good to blame yourself for everything happened or happening around you. It is just running away from the problem, but, you need to solve the problem. If you watch this small conversation carefully, it gives a lot of words of wisdom. So how come Gangadhar aka Shaktimaan’s trust in himself and mainly his karma re-established, and how he found that he was actually walking on the right path? It is good to watch on screen. The second conversation between Shaktimaan and his Guru is again something delightful to watch. It tells the philosophy of Shrimad Bhagvad Geeta, simply and effectively. It is Shaktimaan who need to chose his path and his karma. His guru can simply guide him, but he himself need to walk on the path. Rather than thinking about the outcome of his doings, he need to concentrate on his Karma. He is able to control his actions only, not the results! Very deep thoughts told in very simple way! 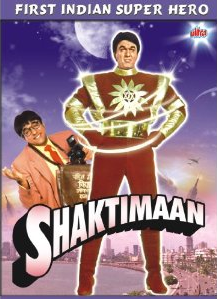 How Shaktimaan returns with a bang is the rest of the episode. What J J and his team will do now? Will Shaktimaan have to face them anytime soon? Will he be able to overpower any or all of them? Will there be any new enemy waiting for him in the near future? All these questions will be answered over the course. A very nice TV serial, which is good at content. There are technical limitations and downsides of course. But, as it is said that – the content is the king – the serial excels there. The incidents are inspired from many places, but they are executed nicely. Main positive factors of the TV serial is content, acting of a few actors (some are unconvincing), dialogs and background music. Some visuals are appealing as well. Mukesh Khanna and Vaishnavi are top performer. The staff of the Geeta’s office is not a group of very convincing actors. Kids are under performer too. Shalu’s track works at most places. The main positive factor is the moral and ethical things the serial spread. It is definitely worth watching. And, as it is now available as the set of DVD, you shouldn’t miss it. It is equally good for children and adults both.